Home > Instagram > How to make a poll on Instagram? Surely, each of you has already managed to appreciate all the advantages of using Instagram Stories. Every day they are becoming more interactive. And in this article, I will tell you how to do Instagram polls and also give you some vivid examples of how you can use them in practice and for business. Here’s a great article about commercial use of Instagram Polls. It gives the information about polls on Instagram and how poll questions bring money to a business account. But let me remind you about Instagram Stories. Do you use it on a regular basis for the promotions? On Instagram, you can share stories about interesting moments of life or temporary commercial offers without cluttering up the main feed. The Instagram Stories tool allows you to create photos and 15-second videos with an overlay of text, emoji, and handwritten notes. A key point of such posts is that they do not live forever. Instagram Stories are automatically deleted after 24 hours from publication. Why do you need Instagram Stories? According to the official explanation of Instagram, a new function is needed for exchanging not very important information about everyday life. All those homemade or insufficiently good photos that you were embarrassed to upload, will no longer just take up memory. You can share them with friends without risking accusations: stories do not clutter up the tape, they are unobtrusive and only those who want can view them. At its core, innovation is very similar to Snapchat and works in much the same way, but with minor differences. Despite the fact that there are not so many features for Instagram Stories and all of them are very simple, not all users are able to deal with them right away. Clicking on the plus sign at the top of the ribbon and swipe from the edge of the screen to the right opens the menu for recording a new story. Everything is simple here: do a tap on the record button - we get a photo, hold it down - shoot a video. You can switch the front and rear cameras or turn on the flash. It is also easy to choose a media file from those that were shot in the last 24 hours: this is done with the swipe down. This includes all the photos from the gallery, including time-slips and branded IG boomerangs. When the photos or videos are ready, you can publish them before processing. Both for photo and video tools are the same: filters, text and emoji, pictures. Filters are switched in a circle by a simple swipe from the edge of the screen. There are six of them, including a rainbow gradient, like on the IG icon. Added text can be increased or decreased, moved around the photo. But to leave more than one comment, unfortunately, is impossible. Emoji is also inserted through the text, so if you want to cover your face with an emoticon, you have to choose. Satisfied with the result? Click the checkmark button, and your video will be available to subscribers. It can be saved to the gallery both before and after. When a story is published, you can view it from the stories menu, hide it from certain users, find out how many people have seen it and who it was. The settings and statistics screen is called up while viewing a story. From here, the story can be saved to the gallery, deleted or published in the main tape, turning into a regular post. The list of viewers is displayed below. Hide the story from any of them by clicking on the cross in front of the name. Settings that are hidden behind the gear icon, allow you to choose who you can answer your stories and hide the story from those or other subscribers. At the same time, privacy settings are remembered and applied to all subsequent publications. Instagram Stories solve the problem of the clutter of the feed, when you have to unfollow friends who publish literally every step. Stories is a relief. Over time, people should get used to the culture of behavior offered by Instagram, and start posting only really important and noteworthy content to the tape. Everything else should fall into the Stories. Right? Now let’s talk about new tools, including interactive polls + NOVELTY sticker with questions from subscribers, as well as the pipette function and “guides” or “equalizer”. Hottest news: At the end of the article, I have added a different method that works for many people, how to fix the bug with the lack of polls and the function “ask me a question”. What is important to know about polls on Instagram? If you are going to answer someone's poll, remember that your answers are not anonymous! The author of the vote will know who answered what, so be careful when answering some questions. How to make a poll on Instagram Stories? Imagine the situation: you look at the autumn shoes in the store, but are not sure about the type. And here you realize that you urgently need a "collective mind" or a council of friends. What should you do? Open the IG app, click on the profile picture to add a new IG Story. Take a new picture or select a recently taken photo you are eager to publish. In edit mode, click on the Emoji icon (a cheerful face at the top) or make a swipe from bottom to top to open the panel with stickers. Select the “Poll”. After that, you will have 2 options for answering the asked question (initially this is YES / NO) and a place for the main question in the pole. You can write a question of any kind, as well as edit the answer options at your discretion. 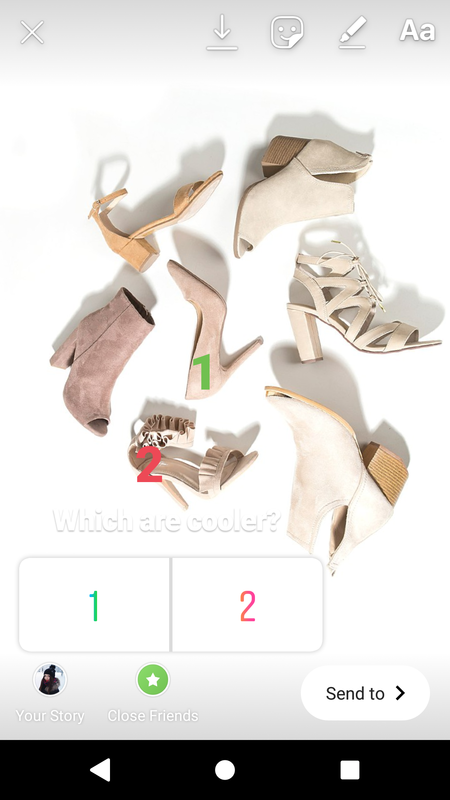 In my example with shoes, the main question in the poll is the phrase: “Which are cooler? ”And 2 answer choices: 1/ 2. After you have written your question and two possible answers, feel free to click on the “Send to” button and publish your Story. Like regular stories, the poll will be active for 24 hours. How to view the poll results? To view your poll results, swipe up from the bottom to open the viewer list. In the opened window, you (as the creator of the poll) will see how many votes each poll received, as well as who voted for which option. During the poll, the results can be monitored in real time. Also, each follower can see which choice is in the lead and re-return to view the updated results while the poll is relevant. After 24 hours, the poll and its results will disappear from Stories. Poll in Stories is a great tool. Now you can directly communicate with customers/followers and get answers to your questions. More recently, another great feature has appeared in insta-stories - a sticker that allows followers to ask the author a question on the spot - through the story. The new sticker is an expanded version of the polls, which we have talked about above. The difference is that polls offer two options for answers, but a sticker with a question allows you to answer more extensively or to ask questions to the author, which he can answer in subsequent stories in one click. How to create a sticker with the ability to ask questions on IG? Start creating a story by clicking on the avatar in your profile. Next, remove or upload a photo or video to the story. Then click on the sticker menu as shown in the first image ⇒ among the stickers, find the “Questions” sticker. Ask your question or write something for your audience. Here you can change the color of the sticker by clicking on the colored circle. By the way, use the swipe to see more colors! Finally, click on Done. On the next screen, you can move the sticker up and down or, with two fingers, rotate it slightly so that it goes obliquely. If you need to add additional elements to your photo or video and choose where you are going to send your question: best friends, Direct, or publish in Story. What to do if you update the application, but the poll and the function "ask a question" do not appear? Most likely the problem lies in the technical glitch. You can try the following manipulations that have helped many users. If you have several accounts and some of them already have polls, then great - you can skip this step. If you have only one account, then you will have to create a new acc on IG. This is necessary because Instagram launches new features on fresh accounts immediately, and the older the profile, the longer it takes to wait for updates. So, register a new profile. There is no need to fill out anything, add friends, so skip all the steps suggested by Instagram, until you reach the account’s home page. From the new account or profile, where you already have the function of polls/questions, start creating a story. Upload a picture and click on the sticker icon. Create a poll or use the questions option. Post a story. Story will be published! In airplane mode, switch to an account that does not have the function to poll/ask me a question. Create a new story with a photo. Go to the stickers. Among them, you should have questions. If you do not see, then use the swipe to see the recently used stickers - here they must be exact. Publish the story in the same airplane mode and, after that, disconnect it and connect to the Internet. Your story should be published in the profile, and the function to poll/ask me a question should now be in the recently used stickers. If these manipulations did not work, then the reason for the lack of stickers, most likely, in an outdated OS on your phone. Instagram makes updates only for more recent versions of iOS and Android, so on older versions, updates do not add new features. If you have an Android or an old iPhone, then you can find someone with a new version of an iPhone or iPad and do all the steps again - on iOS, for some reason, it's easier to fix the problem. In this case, do not forget to exit all accounts on a foreign device later. Hope this guide helped you! Post in the comments, it turned out or not. A little more about the "pipette" and "guides"
In addition to polls, Instagram submitted 2 small, but very useful updates: "pipette" and "set in motion". The pipette tool helps you choose the text color from any pixel in the image. So “Pipette” will help to make your stories more harmonious and pleasing to the eyes of Instagrammers. But the “guides” or “equalizer” is a real present for perfectionists. Now any sticker, hashtag or text can be placed strictly in the center, and it is also possible to align any elements of Stories under one line. Enjoy! In the comments to this article, please share examples of your polls and questions. And also do not be tempted to ask for help if something is not clear. I will be glad to help! And if you have any ideas on what I should post, leave your thoughts in the comment section! Next Post How to get verified on Instagram?